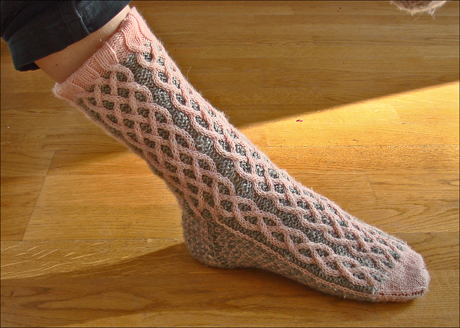 I finally got something close to good pictures of the finished Chuck's cabled socks. 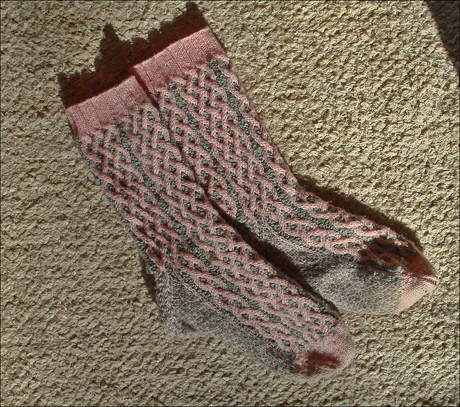 Hanna has used the socks several times and she is very pleased with the fit, and claims them to be very warm too. Being knitted with two strands all over it's quite understandable that they are warm, and the cables add too to the thickness. The fit is perfect for Hanna, so we are all in all very pleased with the project's. A common problem people seems to have had with Chucks's is that they want go over the heel. I decided to use grotesque thick needles in order to overcome the problem, and it payed out well. It also slowed down the knitting speed since I still ha to try to knit the knitted stitches a bit looser and the purled stitches a bit tighter than what would have been natural with this needle size. 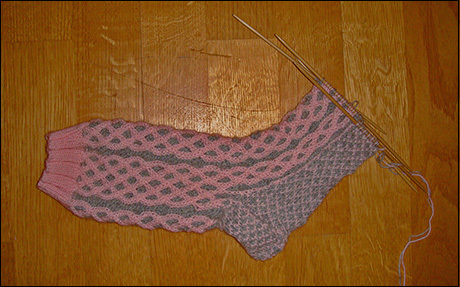 Alterations: I patterned the heel instead of knitting it in just one colour. Cuff, heel and toes knitted on 2,5 mm needles, all cabling on 3 mm.